This was an eagerly anticipated weekend to one of the remotest parts of Scotland, easily accessible due to the presence of the West Highland rail line, which runs from Glasgow to Fort William. Most of the 14 club members met at Crianlarich on Friday night for the hour long train journey to Corrour station. The party atmosphere of the train journey, with the well stocked drinks trolley wheeled up and down was left with reluctance for the desolation of Corrour's dark 1500' high station. Nevertheless, a mere mile walk by head torch on a bright but dry cold night saw us safely to the welcoming, wind turbine powered lights of the hostel, with Nick, the resident warden of this SYHA Establishment having the roaring coal and wood fire stove going well. I couldn't help thinking about the cult film 'American werewolf in London' on approaching the lights of the hostel, but Nick's friendly terrier dog was only keen on snapping up spare food rather than unsuspecting EMC member's jugulars! Nick gave us a 2-minute briefing as to the do's and don'ts of our stay, which emphasised the necessity of removing ALL waste, including bleached tea bags from Corrour Estate. Only compostible vegetable matter and/or non-bleached tea bags were allowed to be recycled in the compost bin. It was a novel and I suspect enlightening experience for most members to be held personally accountable for all their own waste products! Talking of which, the 'lang drap' out-housed compostible toilets with their own internal lighting and alcohol based hand wash provision, were surprisingly acceptable to us townies. Although there were no showers, the constant hot water for washing and kitchen use was an unexpected luxury. With cold polar air from the north and north east prevailing for the weekend, the forecast was basically set fair, and with the white stuff established above 2000' this was the first real winter weekend for the club in 2006. Saturday was a bit disappointing however, being one of those 'bright too soon' days, with hill tops disappearing into cloud and freshening winds, giving rise to the experience of considerable buffeting, a current buzz phrase of mountain forecasters, and poor visibility near the tops. 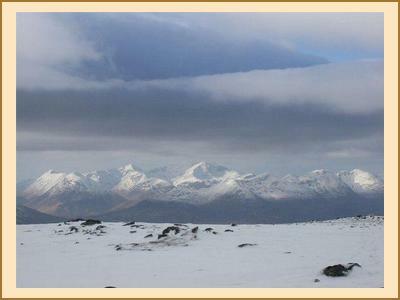 On Sunday the summits were clear but there was even more buffeting. 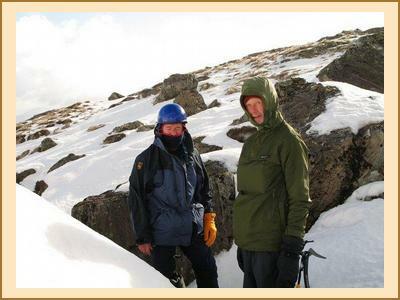 Nevertheless, the club stalwarts ascended all the local Munros and Corbetts, with remoter objectives of Chno Dearg via the winter climbing crag of Meall Garbh and the Easains above Loch Treig also achieved. Leum Uilleum in particular, the Corbett above Corrour station gave a delightful horseshoe walk. Saturday evening activities were as per usual liberally lubricated with anaesthetics of choice, and a fiercely competitive game of Jenga developed. Jenga? Well it looked from a red wine perspective like a psychological game of building blocks to a height and then skill to avoid collapsing the built structure. Nick appeared every two hours to stoke the fire, and late on Saturday evening he stuck up a notice, saying 'bad news I'm afraid.' Not so! In our isolation we were unaware that Scotland had beaten England in the 6 Nations rugby at Murrayfield, and with a Tchaikovsky score. Tchaikovsky? Well, er, the score was 18-12. Those attending were Martin, Alison W, Jenny, Dennis, Alison C, Kenny, Alan, Anne M, Iain M, Bill C, Eileen, Paul, Bill B, and Kathy.